If you use the VLOOKUP function to search for specific values in a list or table, it’s possible to end up with "#N/A" errors—particularly when you’re looking for exact matches. Although these errors are annoying, they occur for a good reason: either the value you’re trying to find doesn’t exist, or it does exist—but Excel doesn’t perceive it as a match because of a formatting mismatch or other issue. 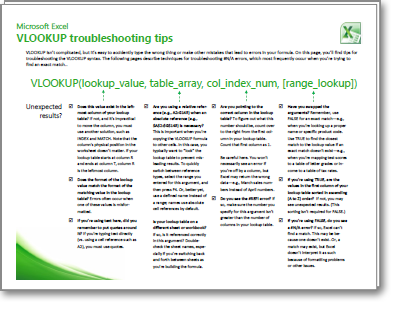 To download a three-page reference guide that offers basic troubleshooting tips for VLOOKUP, click the link below. When you click the link, this document will download as a PDF file for viewing in Adobe Reader. You can print a copy of this reference guide, or save it to your computer for future reference.